Our firm is a two lawyer practice and we concentrate in handling consumer bankruptcy issues. We also do family law, simple separations and divorces, wills and traffic tickets. Maybe you're having problems making payments on all of your bills each month. Perhaps you're so far in debt there's barely enough left over to pay rent and buy groceries. For lots of good people, bankruptcy is unavoidable due to a loss of employment, sickness, or circumstances beyond their control. Give us the chance to help you. Take a few moments to look at the information on our website to learn about us and the way we approach cases like yours. Then, if you feel we could help you get through your financial problems, call us to set up an appointment to discuss your situation. Initial consultations in consumer cases are free and we also offer free parking in our parking lot. We are a debt relief agency law firm practicing law in North Carolina. We help people file for bankruptcy under the bankruptcy code. 528 Wendell Schollander and Wes Schollander can offer you not only more than 30 years experience, but a better way of doing things. When a client comes to us, we understand that they are uneasy about the entire process. We do what we can to make your visit with us a friendly, non-judgmental one. For many people, it is a relief just to know that soon, the harassing phone calls, threats of repossession, and nasty letters will stop. By the time you leave our office, we will have a good picture of what your bills are, where they came from, what assets you have at your disposal and how much income you need to pay your living expenses. But we can offer you more. Wendell brings our clients the added benefit of an MBA and a Bachelor of Science in Economics from the Wharton School of Finance. Wes lectures extensively at legal education seminars to other lawyers about the intricacies of bankruptcy law. We can tell you what the law provides and we understand how it will impact your financial picture. We are both active members of the community and maintain memberships in the North Carolina Bar Association and its Bankruptcy Section. Both are also members and participants in the National Association of Consumer Bankruptcy Attorneys. Wes Schollander habla espanol. Our firm represents both individuals and commercial clients with issues involved in bankruptcy proceedings. After we consult with our client, we develop the most appropriate relief that we can under the Bankruptcy Code. We counsel our clients to aid them in receiving relief and in preventing the same situation from happening again. Some examples of relief include: Chapter 13 - This process allows consumers with income to make arrangements to pay their creditors a reduced amount over time. Chapter 13 bankruptcies are particularly useful for people who are behind on house or vehicle payments and wish to hold on to these items. Chapter 7 - This process is available to both individuals and businesses alike and is the "fresh start" alternative most people think of when they hear the word "bankruptcy." In a Chapter 7, debtors are provided a total discharge from unsecured debts while continuing to pay for a house or cars that they wish to retain. Family Law We do simple separations and divorces. Our goal is to avoid costly and emotionally draining fights that can arise when marriages unfortunately come to an end. Because we avoid a costly and time consuming court litigation, our separation agreements and divorces are often significantly less costly than that charged by other firms. We also help you from having to appear in court at all. 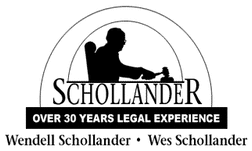 Wendell Schollander has practiced law for over 35 years. He has experience in the areas of bankruptcy, business and family law. Duke University, J.D. Other: Listed in Who's Who in America and Who's Who in American Law. MBA from the Wharton Grad. School of Finance; BS in Finance from the Wharton School of Finance, Univ of Penn. Forsyth County and North Carolina (Council Board Member, Bankruptcy Section, 2005-2009) Bar Associations; National Association of Consumer Bankruptcy Attorneys. Adjunct Professor, Wake Forest Law School (2009-). North Carolina Bar Association (2001-); Bakruptcy Section. Council Board member, Bankruptcy Section (2005-2009); Served on Bankruptcy Section's Committee to recommend changes in the statutory exemptions used in debt recovery and bankruptcy. Drafted a number of the changes that were adopted by the NC Legislature (2004-2005). National Association of Consumer Bankruptcy Attorneys (2001-).